How is it possible that after using LSD you can hear sounds and see colours? I have my own experience with this phenomenon. When I´m lying totally relaxed in bed and suddenly a door is closed loudly, I see an explosion of colours. Are the two brain regions responsible for hearing and seeing, if you´re totally relaxed (for example just before falling asleep), somehow more connected with each other? Synesthesia (Greek: syn = together; aesthesis = perception) is [...] a crossing of sensory perceptions, where stimulation within one sensory modality/stream leads to an internally generated perceptual experience of another sensory modality/stream. Synesthesia does not have to be drug-induced; there are people that experience it always (synesthetes). Their perceptions are often quite subtle, for example specific written characters assume specific colors (Sinke et al., 2012). There are no explicit models for drug-induced synesthesia (Luke & Turhune, 2013). Nevertheless, the neurophysiological changes brought about by them can provide models for why hallucinogens can induce a synesthetic state. The two major classes of psychedelic hallucinogens, the indoleamines (e.g., LSD) and the phenethylamines (e.g., mescaline), have a common site of action, namely activation of serotine (5-HT) receptors. Specifically, they are partial agonists of the 5-HT2A and other 5-HT2 receptors in the central nervous system. The noradrenergic locus coeruleus and the cerebral cortex are among the regions where hallucinogens have prominent effects through their actions upon a 5-HT2A receptors. 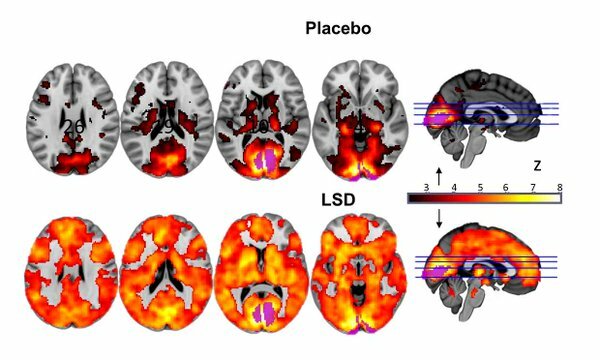 In general, hallucinogens like LSD are thought to inhibit serotonergic neuron transduction, referred to as the disinhibited feedback model. Serotonin (5-HT) is mainly produced in the raphne nuclei (RN) of the midbrain. The RN extends its projections into the brainstem and up into the higher cortex. It has been suggested that neurons of the RN may inhibit sensation, thus protecting the brain from sensory overload. Thus, 5-HT may be labeled to be primarily an inhibitory neurotransmitter. A decrease in 5-HT activity hence leads to disinhibition of the the next neuron in the chain (e.g., neurons in the cortex) and becomes more active (Sinke et al., 2012). This increased activity of the cortex may in turn explain the halucinogenic activity of LSD and related drugs (Sinke et al., 2012). However, a few 5-HT receptors are excitatory ion channels (5-HT3), and some 5-HT receptor subtypes may have excitatory effects (Sinke et al., 2012). Specifically, 5-HT2A receptor activation has been shown to directly mediate an enhancement of nonsynchronous, late components of glutamatergic excitatory postsynaptic potentials at apical dendrites of layer V cortical pyramidal cells. Hallucinogens indeed increase cortical excitability, and activate large areas of the cortex. It has been proposed that this effect of hallucinogens on cerebral glutamatergic transmission may in fact be responsible for the higher-level cognitive, perceptual, and affective distortions produced by these drugs (Aghajanian & Marek, 1999). Along the lines of these observations, the effect is quite similar to the disinhibited feedback model, in that the effects of drug intoxication are due to enhanced activation of brain regions. With regard to synesthetic effects, it is proposed that this abnormal activity spreads to neighboring sensory areas that, in turn, lead to cross-modal sensory activations and hence synesthesia (Sinke et al., 2012). Since serotonergic systems appear to be intimately involved in the control of sensation, sleep, attention, and mood, it may be possible to explain the actions of LSD and other hallucinogens by their disinhibition of these critical systems (Sinke et al., 2012). In a recent study, brain scans revealed that people under the influence of LSD experience images through information drawn from many parts of their brains, and not just the visual cortex at the back of the head that normally processes visual information. While under influence, regions normally segregated spoke to one another. Further images showed that other brain regions that usually form a network became more separated. Both alterations in your brain perfectly explain the many differences in one's perception while under the influence of LSD, which can include (but doesn't necessarilly include) synesthesia. Not the answer you're looking for? Browse other questions tagged cognitive-psychology neuroscience cognitive-neuroscience neurophysiology psychopharmacology or ask your own question. What are the brain regions related to tinnitus shown in this figure?